CWD Ain’t What It’s Claimed to Be? Chronic Wasting Disease (CWD) is a man-made disease that is believed to have purposely originated in a lab in Colorado. Since its “discovery” it has been promoted as being a “prion” disease. In other words, a misshaped protein that, as a result, causes a deterioration of the brain and the destruction of the central nervous system always ending in death for deer, elk, and moose. Recently, an animal protectionist voiced concern about the spread of Chronic Wasting Disease (CWD) in Maine. We all should be concerned about the spread of this deadly to animal disease (it has of yet not proven that it can jump over and infect humans). But, animals, as much as we care about their welfare, even those animals given to us by our Creator as a natural resource to enjoy from viewing to table fare, are not people and should not be treated as such. In doing so, lines of priority in the life, liberty, and pursuit of happiness of all get blurred even to a point of perversion. The first priority, in a natural setting of existence understanding, should always be that of man. Because Man was granted “dominion” over all the plants and animals by our Creator, the first concern is with people. Animals become secondary and of concern in this case because man’s existence is directly affected. The importance of this misuse of pronouns isn’t so much that the writing is grammatically incorrect, something a “published author from Bristol” should know, it is the exposure of the indoctrination that has perverted the minds of millions who insist on categorizing animals at the same existence level as that of man. How sick is that….really? It is impossible to rightly attack any problem or establish any kind of rule or regulation in the management of any animal when the animal is not placed in the correct hierarchy according to relative importance based on the existence of Man. Because our animal-perverse society has muddied the differences between man and animal, such distinctions of utmost importance are lost and decisions rendered ended up being acts of perversion in their own right. This misguided perversion shows when the author takes issue with comments made by the Maine Department of Inland Fisheries and Wildlife (MDIFW) about the concerns of the hunting industry should CWD have a devasting effect on the deer and moose. 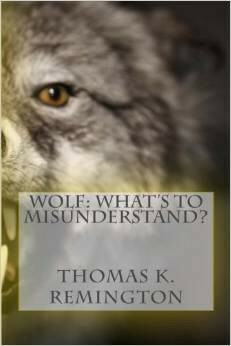 The author chooses to disregard the common sense association that their concerns over the health and welfare of the animals exist in unspoken words from the quotes that were handpicked. Perhaps the upside of this is that the MDIFW sees the potential risks of the spread of disease as being first and foremost a concern for that of the people and their welfare and secondly to the animals and their health…or maybe not. But, make no mistake about it, CWD is extremely problematic and the author does bring up some good points to consider. It is impossible to stop the spread of the disease but steps can be taken to slow it down. The MDIFW already has mandatory regulations in place to help in that regard. Some of those steps may need to be strengthened if the disease shows signs of actually making its way into Maine. Because CWD prions can find their way into the commercial marketing of urine-based scents and lures, I agree with the author that they should be banned. I think the jury is still out on feeding of deer as to whether or not congregated feeding actually causes the spread of disease any more than in a natural setting due to the make-up of the disease itself. There are some trade-off issues that need to be considered when it comes to feeding deer, but the bottom line is that CWD will destroy the deer and moose herds and thus destroy the hunting industry as well as wildlife viewing. As our collectivist society works harder and harder at destroying their own free existence, avidly calling on a fascist government (force of law) to rule with an iron fist should be of concern for all…but isn’t. As with any of this talk, based on utter ignorance of facts, media echo chambers will continue to repeat misguided claims and false information without actually doing any real research to understand the creation and history of CWD. It’s a shame really but nothing more than a reflection of the automatonic existence that has been created for all of us. As a brilliant man recently shared, with Collectivism comes collective ignorance and stupidity. Collectivism ensures like existence. How frightfully boring! According to Outdoor Hub, Wisconsin is toying with the idea to pay hunters up to $1,000.00 to take CWD infected deer with the idea of using this tactic to rid the state of Chronic Wasting Disease (CWD). Some like the idea and others not so much. Of course, there are issues and many unanswered questions. Some obvious concerns are pointed out in the article. One is that you cannot necessarily tell if a deer is infected when you look at it. Some studies have shown that deer can be infected with CWD and in the early stages cannot be observed with the naked eye. Another issue is that of the fact that the infectious prions that carry or cause CWD can remain active in the environment for over two years. To rid Wisconsin of CWD a program of this sort would have to be aggressive and last long enough to ensure that enough time has elapsed to rid the environment of the deadly prions as well as putting into place programs that would stop the spread of the disease from importation or dispersal. Good luck with the dispersal problem. Is there much point in seeking to “sustain” a deer herd if that herd is seriously infected with CWD? Is it better to have a small herd that is healthy, that will, more than likely rebuild, with proper management, after the disease is gone, or to have a “sustainable” herd that is riddled with disease? It would be an immense task to undertake with little, if any, guarantee that it would work. Even with increased knowledge of this disease, it is virtually impossible to stop the spread of the disease. To attempt to isolate one state from all others to rid that state of CWD while the disease persists across borders, makes one ask if such a plan is at all practical. Chronic Wasting Disease has been found in deer in Ontario Province in Canada. Some in Maine and other New England states have taken up a panic or semi-panic mode while saying and doing stupid things. One thing is for sure. Few of us know anything about the disease…even those pretending to be an authority. As with most things like diseases that are serious, why does it seem the focus is placed on the wrong aspect of the problem? It seems an American thing to avoid the real issue and place the focus on emotional and political BS. We see this in discussions about AIDS and the Second Amendment. With AIDS, instead of addressing the immoral lifestyles that most greatly contribute to the spread of the disease, we only focus on a cure in order to permit the perpetuation of homosexuality. In speaking of guns, Americans almost never focus on the real issue of what causes a person to resort to violent behavior that is deadly to other humans. So much effort is placed on ensuring that law-abiding citizens have their right to choose how to protect themselves taken away. And now we see Chronic Wasting Disease (CWD) sneaking up on us. Many admit that scientists don’t fully understand the disease. They have a better sense of the end result – almost – than the cause and the spread. As is typical, with diseases such as CWD, brucellosis, Echinococcus granulosis, Neospora caninum, etc., where both wild and domestic animals can become infected and infectious, often the blame, if you will, is placed on captive animal facilities as being the culprits in the growth and spread of these diseases to the wild population of the same animals. This has never been proven as fact and is next to impossible to do so. To state otherwise is dishonest. Part of the argument being expressed here is that an agriculture department will not be strict enough in regulating captive cervids and that authority should be given to fish and wildlife agencies. There is serious political corruption that exists within both departments that we should never consider one government agency as being better at regulating than another. History has shown us that fish and wildlife agencies can be just as corrupt in their wielding of authority for political reasons as any agriculture department. By directing the focus of the problem on captive cervid ranches, we may be doing ourselves a real disservice when it comes to serious efforts to understand this disease, for without the right knowledge proper control if there is such a thing, is impossible. For those who don’t know, I will tell you that captive cervid ranchers would put up “high fences” and “double fences” if they could afford it in order to protect their herds from the spread of disease from outside into the ranch. It’s been several years now since I last spent a great deal of time learning about elk and deer ranching, but the last time I recall discussing double fencing the cost ranged somewhere around $1 million a mile. The argument for high and double fencing is to prevent any kind of contact between captive animals and wild ones. It is sometimes lost in these emotional discussions that ranchers absolutely do not want any disease in their herds. It’s stupid to think differently. CWD within a herd of captive elk or deer would put the rancher out of business. Because some choose to believe that diseases like CWD originate within the fences and is spread beyond the fences through contact with other animals outside the fences, they fail to understand that it can just as easily happen in the reverse. There was a time when in areas where CWD occurs, no instances of CWD had been detected in captive cervids. That should tell us something. It seems the real issue is in regulating the import and export of captive cervids, especially across state lines. I visited domestic elk ranches in the West a few years back and was impressed with how conscientious they were about every aspect of their business, including the threat of disease. Again I say, any serious disease will destroy that business and none of them want it. Captive deer are captive, enclosed behind fences, and unable to “disperse.” It, therefore, makes a bit of sense that they are less likely to be the chief culprit in the spread of the disease. Any agriculture business needs to be responsible for disease spread and for the most part, I think that is the case. We can do many things to reduce the risk of the spread of disease, or at least perhaps slow it down, but short of a cure, there is little hope of completely stopping it. Ensuring that we keep our focus on the problem in the right places, prioritizing them from a scientific position rather than a political one will go a long way in addressing a serious disease spread. *Editor’s Note* – This ruling probably should have been put into effect a long time ago. Maine should also consider the same rules for other game and animal species that spread disease – coyote/coywolves and foxes come to mind. AUGUSTA, Maine — With Chronic Wasting Disease discovered in bordering Quebec, the Maine Department of Inland Fisheries and Wildlife implemented emergency rules designed to protect Maine’s deer and moose herds, and keep Maine CWD free. CWD is an always fatal neurological disease that affects white-tailed deer, moose and other cervids such as elk and caribou. CWD is caused by a mutant protein called a prion, which causes lesions in the brain. Research shows prions can be shed in saliva, blood, urine, feces, antler velvet, and body fat. Prions bind to soil where they can remain infectious for years. CWD is always fatal, there is no treatment, vaccine or resistance, and once present in the state, it is nearly impossible to eradicate. In addition, the rule also prohibits the temporary importation of cervid carcasses and parts that are in-transit through Maine to another jurisdiction. These rules apply to all states and provinces with the exception of New Hampshire. Do not use urine-based deer lures or scents. CWD can be introduced into the soil with these scents and lures and lay dormant for years before infecting a deer herd. Many, if not all these products are derived from CAPTIVE deer, where the risk of CWD is greatest. While currently legal, avoid using these products in order to protect Maines moose and deer herd. Please follow the laws and rules regarding the importation of harvested deer, moose, or elk from any state or provinces (other than New Hampshire). CWD carried in the brain and spinal cord of infected deer. It is vitally important that these parts are not transported across state and provincial boundaries. Report deer that appear sick, weak, or starving to the Maine Department of Inland Fisheries and Wildlife so that the animal can be tested for CWD. Early detection is the key in stopping the spread of CWD. Avoid feeding deer and encourage your friends and neighbors to do the same. Feeding artificially concentrates deer, creating conditions increase the risk of CWD transmission. Feeding also attracts deer from long distances, increasing the likelihood of the disease becoming established in Maine. Following these guidelines will help prevent the spread of CWD as Deer shed prions in urine, feces, and saliva and Infected animals can start shedding prions nearly a year before showing clinical signs of the disease. “We hope that all hunters take an active role in keeping CWD out of Maine by doing their part to prevent the spread of CWD,” said Woodcock. Sometimes what someone says about something doesn’t make a lick of sense. Such was the case when I read a report about cars crashing into deer in Aroostook County, Maine. Let’s see if we can make any sense at all over this. Huh? I want to know, other than educating people about the potential problems of feeding deer (accidents), what “everything” is that is being done to keep deer out of the roads. Is that kind of like doing everything to make sure bears and coyotes don’t destroy the deer herd? Perhaps global warming can resolve this problem(?) too. I just don’t plain get it when the biologist says that deer are now spending time living in towns where there are roads and cars. I can only guess what this means but this statement appears to be contrary to the talking points always spoken by MDIFW officials that deer winter in their idealistic deer yards, which have all been destroyed, or they die. Is MDIFW now suggesting that deer adapt and due to reduced habitat and the overwhelming presence of large predators, they have moved into town where the odds of getting run over by a logging truck are less than being eaten alive by coyotes, bobcats, and lynx? However, the same biologist attributes the growing deer population to (you have to get ready for this) “reduced coyote predation, supplemental feeding and relatively mild winters.” MDIFW evidently believes their coyote program in Aroostook County accounts for part of the increase in deer but state that there hasn’t been a severe winter in Aroostook County in 10 years. It must be like all good environmentalists would do, MDIFW changed the criteria as to what constitutes a severe winter. Perhaps it’s just the thought that global warming exists, therefore, there is no longer any such thing as a severe winter. 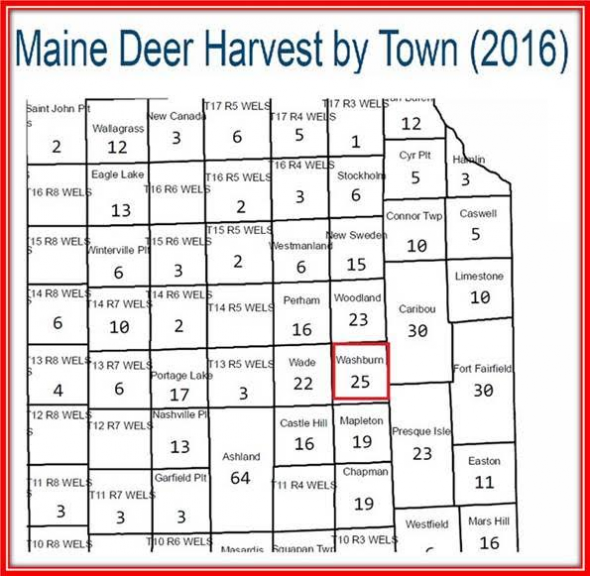 Maybe MDIFW knows from their ongoing deer study, which is a huge secret, it appears, that there are more deer in the North Country than they thought. But, we’ll never know that because they never share that information with anyone…unless it makes them look good. But isn’t this report and all comments geared to address but one thing? – feeding deer. MDIFW does not like it when people feed deer. They never have and probably never will until they can find a way to tax it or somehow make money from it. Never finding anything good to say about people feeding deer, MDIFW goes out of their way to even make up reasons why people shouldn’t do it. This same “expert,” who claims there are “[a]bsolutely, there are more deer this year,” is contrasted by what the Washburn Police Chief said, “It’s not clear if there are more or less deer-related crashes this year than in others.” Well, don’t ruin a good story injecting facts into it. Fat deer that can’t get out of their own way are dropping like flies. In more efforts to demonize deer feeding, the regional wildlife biologist says, “In some places, the deer have over-browsed their natural winter foods such as hardwood trees.” He also says there’s nothing left to eat. Not to be just contradictory, but, if this is true doesn’t this mean three things? One, that if there wasn’t supplemental feeding, deer will starve to death. Two, deer must have grown so much in numbers they have exceeded carrying capacity, and three, deer are eating their “natural food” despite feeding programs. If this is the case then why hasn’t MDIFW begun issuing “Any-Deer Permits” to reduce the size of the deer herd. We are told that the population has been “swelling” for at least five years (and it must be longer because Northern Maine hasn’t had a severe winter in 10 years and we know that, when convenient, severe winters are the biggest killers of deer.) So what’s taking so long to get those Any-Deer Permits passed out? Surely it would be much better for everyone if the deer were legally harvested by hunters, and for food to hungry people, than to simply let them starve to death while MDIFW continues to promote the stoppage of supplemental feeding. Or isn’t this just about injecting some more emotional clap-trap into the media to discourage them to stop feeding deer? But most bizarre of all in this article involves the comment apparently intended to address disease…or something. To be forthcoming, there is a threat to the spread of disease, when any disease is present and when there are large concentrations of deer. MDIFW has always stated deer feeding programs as being potentially problematic in the spread of some diseases. However, I have tried to get my wee small brain wrapped around the very last statement at the end of the article. I could spend hours guessing what any of this might mean. “Eventually” we have no idea what is going to take place. If you believe the lies about Climate Change, then you might also believe that there might be more deer in the north and fewer moose, Canada lynx, etc. Historically speaking, there has never been an overwhelming number of deer in the North Woods of Maine. Experts love to be like echo chambers and when it’s convenient, tell us how northern Maine is at the northern fringe of the whitetail deer’s range. They also like to tell us, when it’s convenient, that severe winters keep the population down. If it’s convenient, as appears in this case here, the population has “swelled” and it’s because people are feeding deer AND the winters are mild – convenient truths. Maybe we’re all gonna die!! I’m not sure, but I’m guessing the “expert” knows nothing about gene pools but it makes for good copy, as I have seen many places before. MDIFW hates it when people feed deer. I understand their position and their reasons given. I can’t say that I agree completely with their reasoning about it. I think it has become exceedingly clear the MDIFW and the State of Maine would have a difficult time trying to stop it. The upside to deer feeding is the sense of ownership that many people take concerning their local deer herds. A lot can be said about that. Has anyone done a study to determine how much supplemental feeding is taking place and how many deer that involves? This might tell us what percentage of the overall population of deer is being affected and whether or not any of this hubbub is worth being that concerned about. Just asking. I recall many years ago emailing with Maine’s head deer biologist about feeding programs. I don’t have the exact quote but essentially he said (at that time) the number of deer affected by feeding was so small percentage-wise, that it wasn’t worth making a fuss over. What, if anything, has changed since then? It sounds like, from what I read in this article, that efforts are underway to move deer feeding locations away from highways or to places that don’t cause deer to have to cross busy highways to get to them. This is positive. Maine is fortunate that is doesn’t have diseases like Chronic Wasting Disease to deal with. If and when that time comes, deer feeding stations will have to either become illegal or designed in such a way as to limit the threat of diseases spreading. However, in those states that do have CWD, efforts to ban feeding has shown little change in the presence or spread of the disease. I guess I’ll leave the “shallower gene pools” for another discussion. *Editor’s Note* – Take notice in this article that the Sierra Club says this reinforces their belief that there needs to be more wolves because they would kill off the sick elk. Yessiree Mistah! The brains of a slug. The state wildlife veterinarian told Wyoming Game and Fish commissioners that a vaccine to fight Chronic Wasting Disease appears to have failed in a test among live elk. 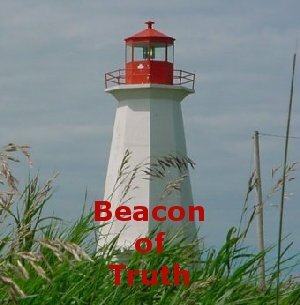 Dr. Mary Wood cautioned that her findings are preliminary, that they haven’t been peer-reviewed or published, and that there is a hiccup in the study. Nevertheless, she said the live tests revealed a statistically significant difference showing the vaccine to be ineffective. *Editor’s Note* – It appears from reading this article, that ALL remedies suggested for a problem on how to stop wolves from killing livestock, involve most anything except getting rid of wolves. Why is that? Wolves have become far more aggressive because of measures instituted to prevent mad cow disease, researchers have said. Iberian wolves in north-west Spain used to live off the abandoned bodies of dead animals. But 15 years ago, a rule was introduced to ban farmers from leaving the carcasses to rot on their land — and so wolves had to hunt for their food elsewhere. Since then, they have been aggressively hunting deer, boar and wild ponies — and attacking cattle. Who Should Regulate Captive Cervids? “They make the case that not only is deer farming a legitimate agricultural endeavor, it’s also one that puts otherwise unproductive land in depressed economic areas to good use. It amazes me the depth of ignorance and the breadth of bad information that easily become emotionally intoxicating talking points when discussing animals and disease and the role of government. Anyone who has read my work understands I have little good regard for government but I have less regard for environmental, non governmental groups that love to play god, while forcing some to play by different rules than others. In a recent opinion piece found in the Idaho Statesman, “GUEST OPINION CHRONIC WASTING DISEASE Idaho is just not doing right by its wildlife,” by John Caywood, all this is brought to the surface. Several years ago I worked with the Idaho Elk Breeders to help educate and get the word out about that industry and to thwart the efforts of some, led mostly by the Idaho Department of Fish and Game (IDFG) and special interest groups, to shut down the domestic elk industry because of trumped up charges of irresponsible ranchers and the threat of spreading disease. It appears some of the same players are back at it again using emotional clap trap to push their agendas in a misaligned direction. Please understand that those claiming there is a threat about the spread of disease wrongly are telling people that the threat comes from domestic elk spreading disease from the source of the ranch out into the rest of the world. How ignorantly absurd and flat out wrong! Domestic elk ranches in Idaho have never had one reported case of chronic wasting disease, as seems to be the biggest concern of the letter writer, and from the many elk ranchers I have met and communicated with over the years, they tell me they fear that their animals will contract diseases from infected wildlife, of which the Idaho Department of Fish and Game seems to be deaf and dumb about. An honest look into the history of chronic wasting disease will show that it just doesn’t appear on a ranch out of the blue. The State of Idaho has restrictions on the importation of livestock from states where disease is in existence. The actual threat that exists in this case is that the government-cared-for wildlife will infect a domestic cervid industry that has for years proven themselves to be responsible, dedicated and disease free. It’s absurd to think elk behind fences are threatening the wild deer, elk and moose of the state of Idaho. But if we look at who’s making the noise over this change in regulations, it’s the same players as always. 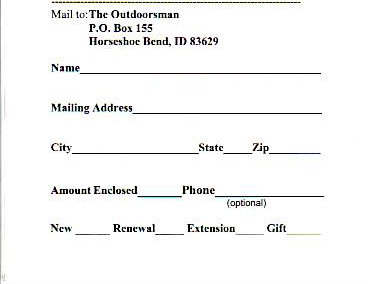 The writer evokes the virtues of the Idaho Sportsman’s Caucus Advisory Council (ISCAC), which historically has been a mish-mish of different people with a gripe claiming the several thousands of members on their side that don’t really exist. In addition, ISCAC has always been the mouthpiece for the Idaho Department of Fish and Game, and, once again, historically IDFG has opposed every aspect of the Idaho elk ranching industry, especially the hunting ranches. The domestic elk industry in Idaho has an immense task on their hands keeping their livestock protected from the diseases present in the wild ungulate and other wildlife populations. Chronic wasting disease has been in Idaho for several years unknown by most and it didn’t get there from the elk ranchers inventing the disease but was imported into the state via carcasses of wild game. If there is so much concern about disease in wild game animals coming from the elk industry, consider a few simple facts. One, elk ranchers are not interested in allowing disease into their businesses. Why would they? It’s their livelihood. There is no reason they and the Department of Agriculture would reduce the amount of disease testing, if it would threaten the elk industry. Two, they have proven that they run a clean ship, not because they have been testing every elk killed for disease for the past 15 plus years but because they have done everything right to protect their livestock from the disease on the outside of the fences in addition to following the import regulations. In short, they know what needs to be done. Third, wolves are known carries of well over 30 diseases, many of them harmful to humans as well as livestock. It is a known fact that at least 2/3rds of all wild wolves in Idaho contain the Echinococcus granulosus tapeworm that can be fatal to humans and create Hydatid cysts in the organs of elk. There is at least one well-documented case of human hydatidosis in Idaho. Wolves also spread Neospora caninum, which can cause abortions and neonatal mortality in livestock. All of this spread from outside the elk ranches. And with all of this, IDFG still denies that there is any risk of disease from wolves and continue to place their hypocritical focus on the elk industry. Maybe it’s time that the State of Idaho is required to test every one of their wild animals before being allowed to get near an elk ranch.